I recently heard from a friend who told me that her husband had gastric bypass surgery as a way to deal with both diabetes and kidney disease. Wow! This is a tricky combination because not only does he now need to lower his carb intake, but protein as well. Most successful diets depend on the “Lean and Green” approach meaning increase protein, lots of low-glycemic veggies and no carbs from grains or sugars. According to website Obesity Coverage, patients who have gastric bypass surgery are encouraged to eat small amounts of protein throughout the day. Eggs, skim milk, chicken and protein shakes are recommended in the Gastric Bypass Diet Guide. But, if one also has concerns for the kidneys, proteins need to be decreased a bit. According to the Nephron Information Center, Americans consume over 100 grams of protein a day which is more than double what our bodies require. Excess protein in the body puts the kidneys to work – overtime! For a person with kidney disease, they still need protein to ensure good health, but a lot less. A 200-pound man only needs a little over 50 grams of protein a day and a 150-pound woman about 40. High Biologic Value foods (HBV) have about 7 grams of protein per ounce. These are the foods that come from animals and are a complete source of the essential amino acids and cause the least waste. A person with kidney disease needs just a couple of grams fewer than recommended, but enough to keep the body functioning. I would suspect that for gastric bypass patients on a low-calorie diet, the body will tap into the protein for energy and malnutrition is a risk. This is all very complicated! So, what do you eat if you can only have small amounts of food that are low carb and low protein? Well, that got me thinking about my dressings, slathers and dips. Personally, I am happy with lots of low-glycemic veggies if I can top them with full-flavored foods like herbs, garlic and onions. My post gastric bypass friend is probably too sensitive to these intense foods right now, but hopefully eventually, he can enjoy foods with BIG herbal plant-based flavor. Most of my salad dressings rely on raw honey to create that fabulously luscious combination of fat, salt and sweet that can quickly lead to weight gain if the daily carb load is too high. So, in the spirit of cutting out a bit of the carb from the dressings, I thought I would try using tofu to create a creamy herbal concoction. The garden is brimming with cilantro and basil, and with the scapes I still have in the fridge, “Green Goddess” was on the docket today. This recipe makes about 1 pint of dressing/dip. I served it on a mixed green salad, but it would make a great dip for carrot sticks, celery sticks, cucumbers or roasted potato wedges. It would also be a flavorful sandwich spread. Directions: Blend all ingredients until smooth and creamy. It seems ubiquitous that when one has copious quantities of garlic scapes – or even ten – that they be turned into pesto! I’m just never sure what to do with so much of the stuff, but today, pizza seemed to be a great idea. It’s the Fourth of July Weekend, not too hot and the perfect time to practice my pizza making skills! The great thing about making pizza is to leave the toppings out and have everybody make their own. This allows for a long relaxing meal on the deck because we can only do one pizza at a time. They each take about 8 minutes in a 500 degree oven, so just enough time for salad and conversations with guests as some are in the kitchen and others on the deck. It’s my secret weapon for really making entertaining relaxed! Some of you are probably wondering why I am doing the pizzas in the oven. Well, we sold our property where we built our last pizza oven and have yet to make our wood-burner at the farm. That project is in queue! Last year I left a few onion sets in the ground over winter to go to seed this year. We have these very architectural beauties decorating the garden beds, and the seed heads, like garlic scapes, carry the flavor of their parent plant. Onion flowers have a mild onion flavor that is great on salads, pizza or enchiladas. Here you can see the little white flowers along with a few of the green onions chopped up and tossed on top of the pie. This is the same crust recipe that I have used in the past, however I was out of the sprouted wheat, so used only white flour. This crust was good, but didn’t have the chewy texture I get with the sprouted variety. I am no expert, but flour really makes a difference to a good pizza dough. In five years of making dough, I don’t think the dough was ever the same twice. There is something about humidity and water flour ratio that can really have an impact. The most important thing to remember with this cold fermentation dough is to leave it just a tad bit stickier than bread dough. 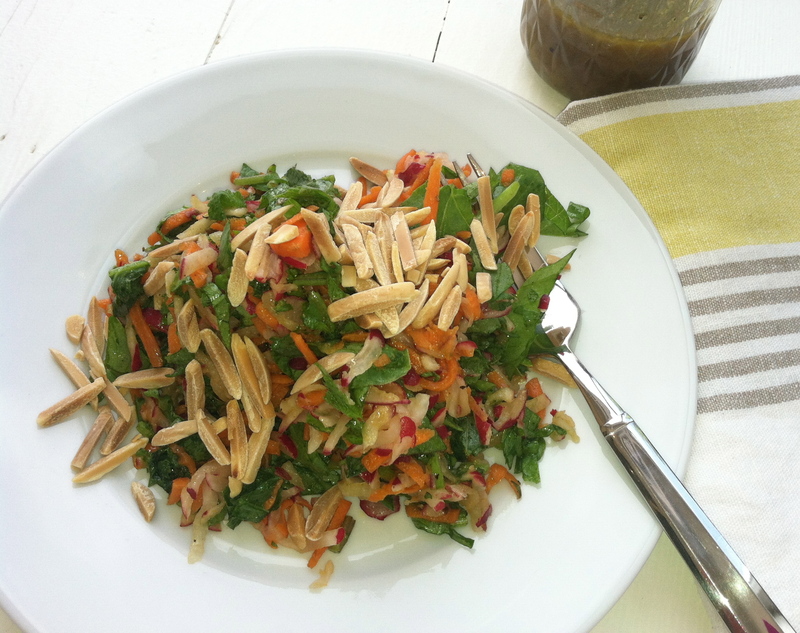 Here’s the recipe with the sprouted wheat. As for the pesto, garlic scapes make it simple. No peeling garlic needed. You just toss a bunch of the scapes in a food processor with all of your other pesto ingredients and voila! 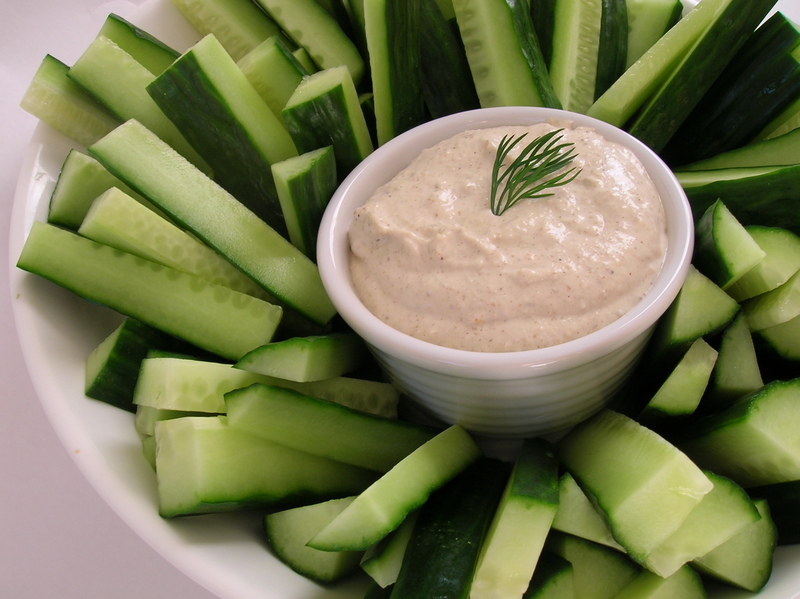 This spread can not only add flavor to pizza, but is a great sandwich spread or veggie dip. Enjoy! Do you ever wonder what happened to good old-fashioned pie? 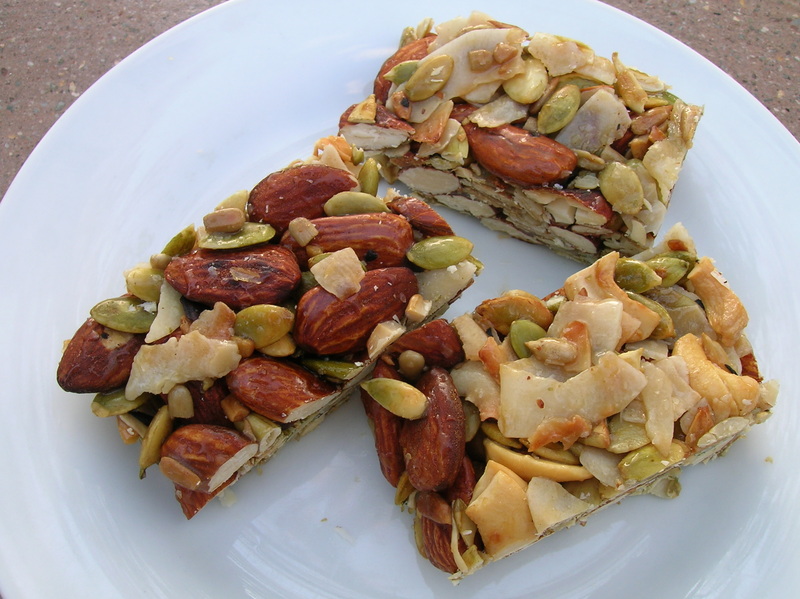 Do you occasionally crave it, then find the slice that sits in front of you to be woefully inadequate? What happened to that thick slice of pie chock full of fresh fruit with a richly flavored, not-too-dry yet flaky crust? I sometimes dream of that pie, but so often forget it can’t be found in a bakery. We can all find lots of mediocre pie at chain restaurants and grocery stores but if you want to find the real thing, you might be looking forever. Perhaps some nice old Finish lady in Northern Minnesota could hook you up, but if you’re looking in a store or pastry shop, you’re probably out of luck. I feel bad for kids these days because I don’t think they’ll ever know what pie really is. There is just something about old-fashioned pie that can’t be replicated in the bakery kitchen. Having grown up with a nice old Finish lady to show me the ropes, there are a few things I know. First, butter is a must. I am a practicing vegan except when it comes to pie – no margarine allowed. The dough has to be cold, cold, cold so leave it in the fridge for a good long rest before you roll it. And finally, don’t roll your crust too thin. It’s just a beautiful thing to eat a slice of pie from tip to crust – to end with a generous chunk of flaky dough lightly kissed with caramelized fruit juices and sugar. Mmm mmm! I know that one problem with pie is that it seems too difficult. So many of us just don’t have the time anymore, so I made a galette instead of pie. Galette is a fairly easy alternative allowing for free form rather than fussing with a pie pan and crimping edges. Fortunately, with a galette, we still get that old-fashioned sense of the pie! Crust: For a really clear and easy-to-follow recipe, see Elise’s directions at Simply Recipes. Cut the plums either into small chunks or thin slices. Place them in a mixing bowl. Add flour, sugar, nutmeg and lemon juice and mix. Roll out the pie crust to about 1/8 inch and place on parchment covered cookie sheet. pour plum mixture into center of pie crust. Push all the plums together into a tidy flat circle. 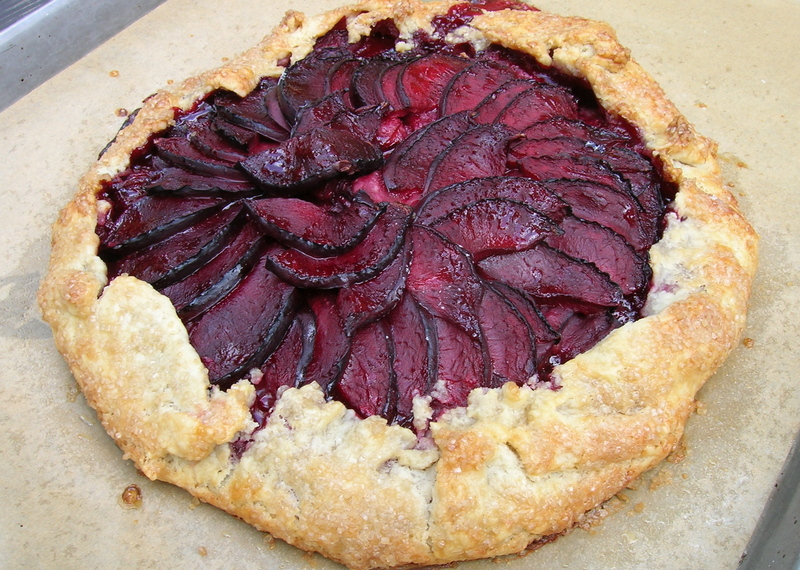 Fold the pie crust up over the plums crimping the dough where it doubles over itself. Brush the dough with the egg wash and then sprinkle with turbinado sugar. Bake for about 50 minutes until the dough is browned. Rumor has it there is a bumper crop of strawberries coming out of Florida lately, so prices are running a little lower than last year. 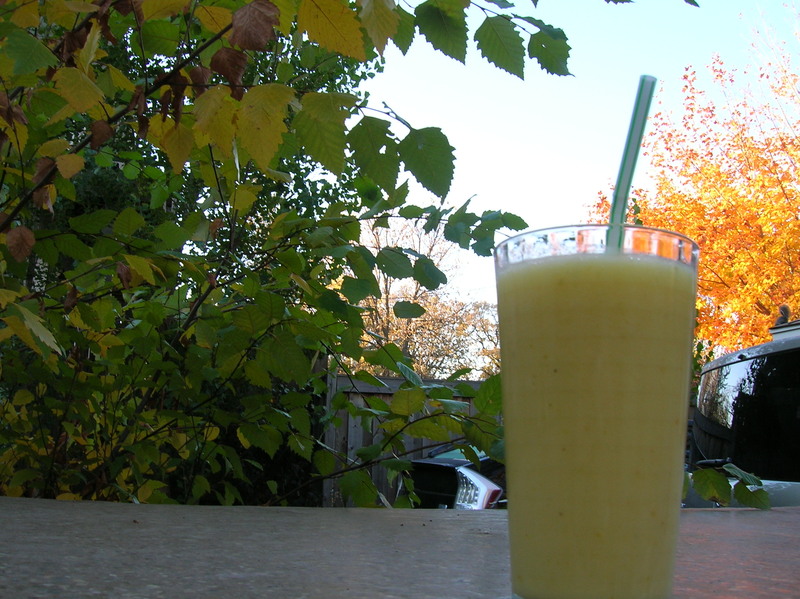 Bad news for the farmers – great news for those of us crazy for smoothies! 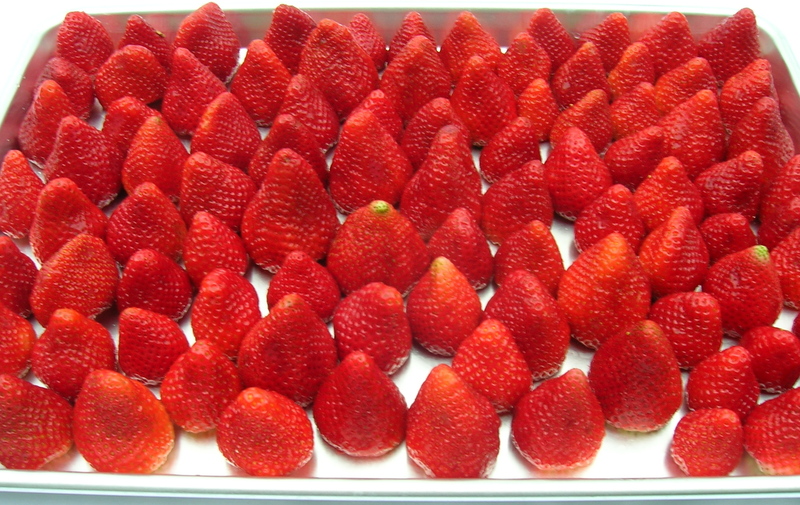 The warm weather has also reportedly upped the sugar content making the berries sweeter than in the past. Frozen strawberries add a luscious creamy texture to smoothies and when combined with pineapple, banana and spinach, it’s pure delight! 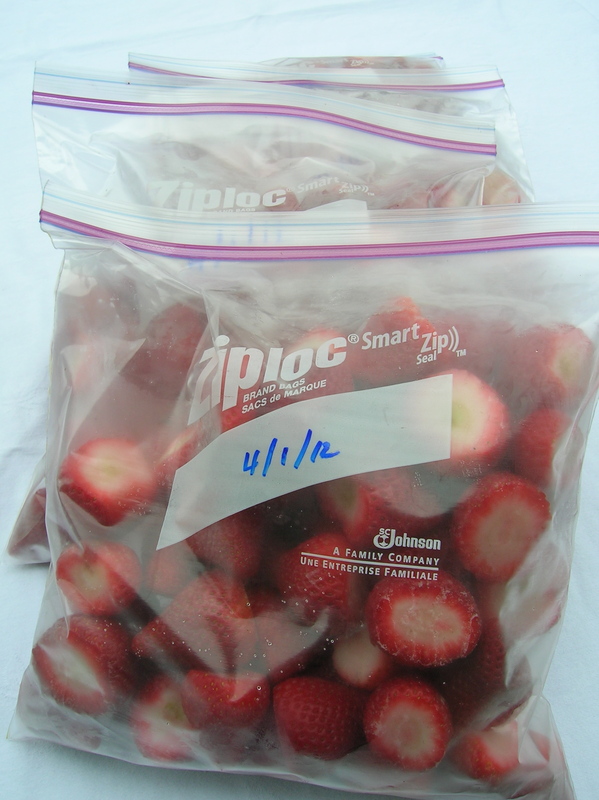 All winter I waited patiently for Spring’s delivery of this lovely fruit, so when organic strawberries began to arrive at Costco a few weeks ago, I knew what I had to do – buy in bulk and freeze so I could enjoy the berries all winter long! This is definitely a cost-saving measure as organic frozen berries run about $4.00 per pound compared to these at $2.80. label and store for up to one year. This is the salad dressing we serve on arugula to top the pizzas. It’s is a crowd pleaser. It’s a great all-purpose dressing that tastes great with any green, can be used on sandwiches or as a bread dip for appetizers. I make this in a large bottle and store it in the pantry – no need to refrigerate. Makes approximately one quart. The only way to get my son to run errands with me is to bribe him. As you can imagine, this can sometimes be costly and frustrating! But getting him to the coop is easy and free…all I need to do is remind him of the samples! He usually lingers by my side in the fresh foods area picking out bananas and other fruits, but as soon as we turn the corner, he beelines to the deli for samples of cheese, spreads, crackers and salads. The other day he came running up to me with a little cup filled with some sort of a kale salad. “Did you try it?” I asked incredulously thinking the coop had cast some sort of spell over the boy who hates vegetables. Long grate the carrots by cutting them just the length of the food processor feed tube. Empty into mixing bowl. Next grate the beets the same as the carrots. 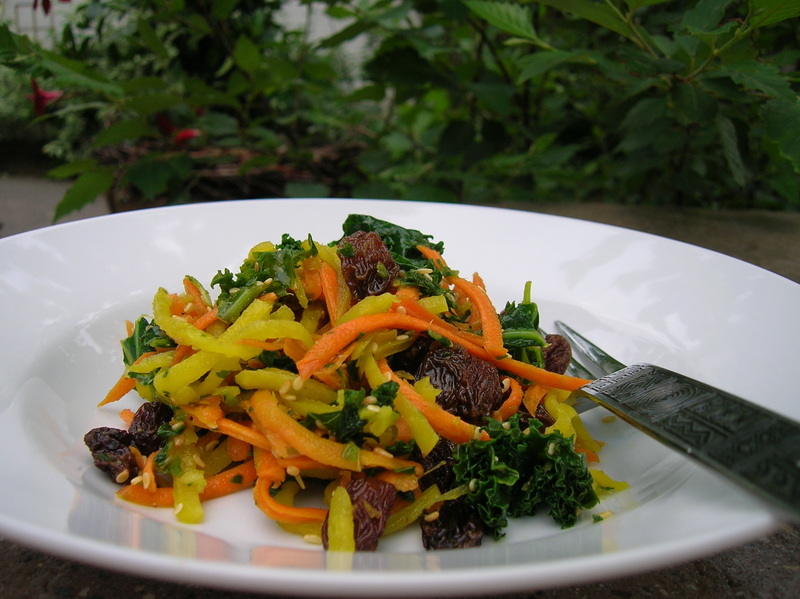 I chose to quickly saute the golden beets in about a tablespoon of sesame oil as they were a titch bitter when raw. Leave them a little crunchy to the bite. Mince the garlic, jalapeno and ginger in a food processor and add to carrots and beets in mixing bowl. 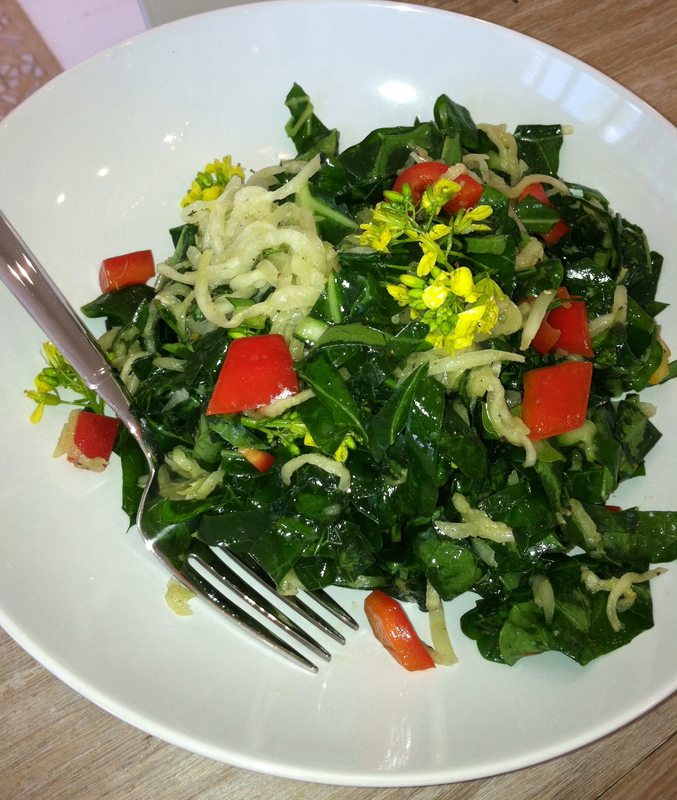 Remove the stems from the kale and chop the greens into fine pieces. The kale can be massaged to soften, steamed or sauted. 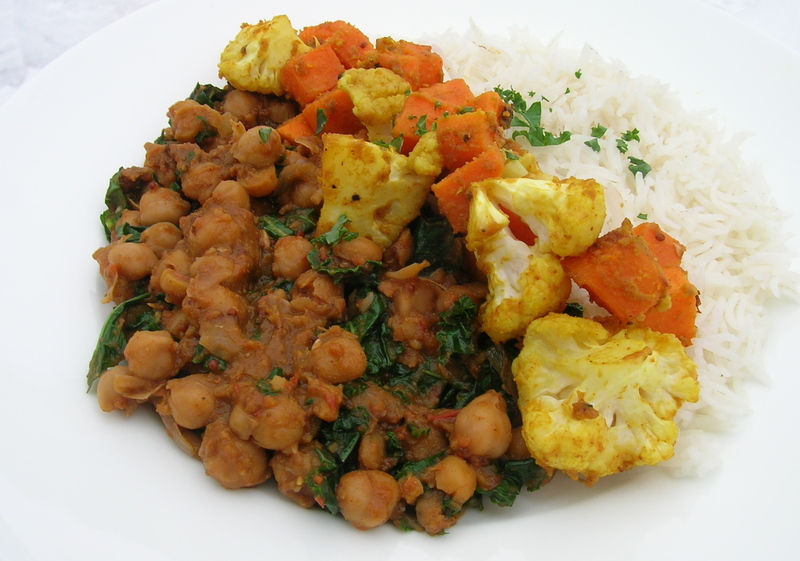 Mix all ingredients together in a mixing bowl and season to taste. Serve at chilled or at room temperature. It’s the time of year that my mind wanders off to Honduras, Ecuador and Mexico. I dream of warm weather, tropical foliage and platanos! Platanos are particularly important in the diet of Coastal Ecuadorians, and I don’t believe I ever had a meal that did not include them in some form. They usually eat the plantains green either fried, baked or mashed to make empanada dough. My favorite way to eat the platano is fried and smashed in what they call, “Patacones.” In other parts of Latin America fried and smashed plantains are called, “Tostones.” They are an acquired taste as they tend to be quite dry, but the minute I tasted them topped with hot and spicy Aji, I couldn’t get enough. Aji is a hot chile, cilantro and lime condiment served everywhere in Ecuador. 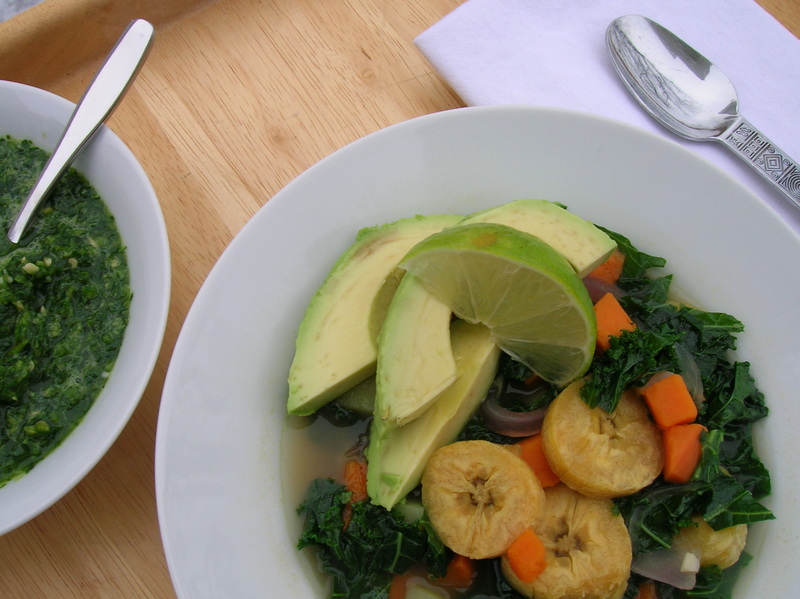 An Ecuadorian custom from the highlands is to serve a light soup as a first course for the mid-afternoon meal, and it’s common to see a few platanos floating around the broth with diced potatoes and a sprig of cilantro. Slices of avocado, toasted hominy and Aji were always served with the soup. Today’s recipe combines an Ecuadorian platano fetish with my never-ending quest for maximum nutritional value. Here you will find copious quantities of kale! And don’t even think about eating the soup without the Aji. Yes, it’s a condiment to be served on the side, but it without it, you’ll feel like you’re eating mashed potatoes without the gravy. Blend together in food processor or blender. Be careful not to overcook this soup. Serve immediately. Heat oil in a stock pot. Add onions and cook until they are crispy. Next add the garlic and stir it until fragrant. Add water, cumin, salt, potatoes. Bring to a boil and cook until the potatoes are almost tender. 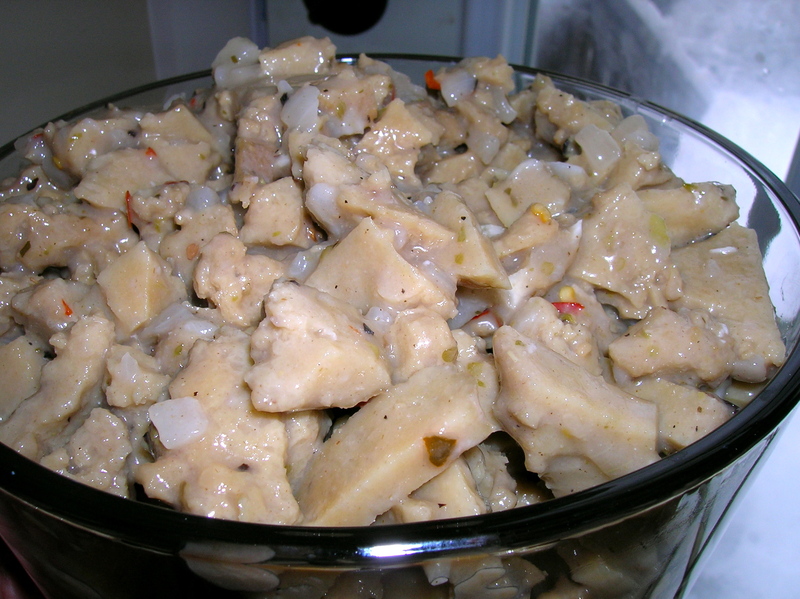 Add plantains and cook for a few minutes until the potatoes and plantains are tender. Add the kale just before serving. It should just wilt and turn bright green. Serve with Aji, avocado and lime on the side. Last week when I went for groceries, the goal was to make the cart look like a CSA box. Midwinter legumes, grains and soups have been great, but this time of year you may feel your body craves the vitamins from more rainbow-colored foods. At the grocery two things particularly caught my attention: beets and greens. I bought four hefty deep purple roasters as well as mounds of kale and swiss chard. 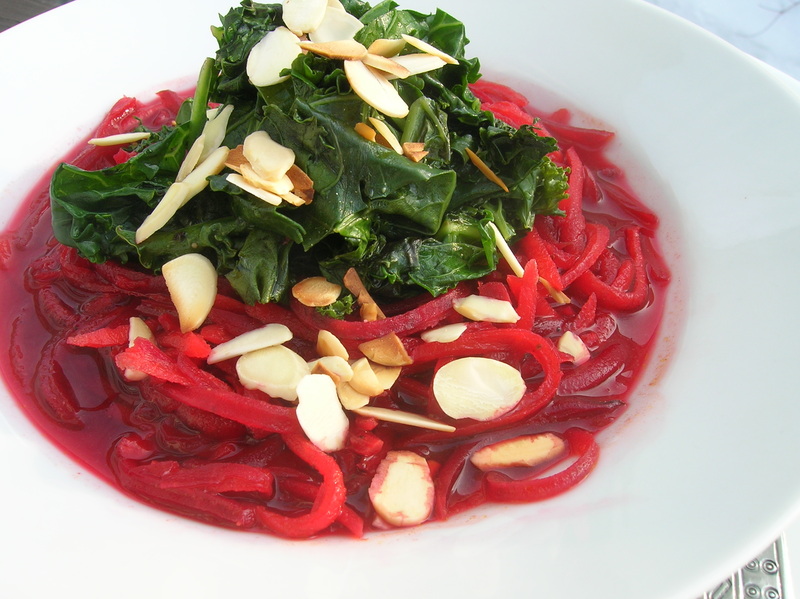 Last week’s Beet Sweet and Kale Soup was so satisfying, I’m loving the look of the ruby-red long grated strands, so having two of the beets already roasted in the fridge made this warm salad really easy to make. 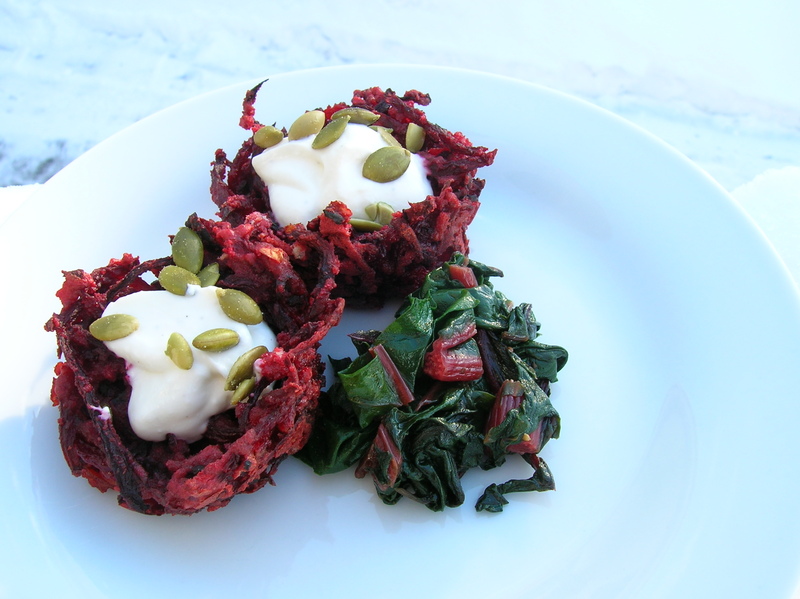 I filled the nests with a Greek yogurt seasoned with salt, pepper and a bit of minced ginger, but can imagine them stuffed with sautéed mushrooms and goat cheese, humus, or just shaved pieces of Pecorino Romano. This will make approximately two dozen nests depending on how large the beets. 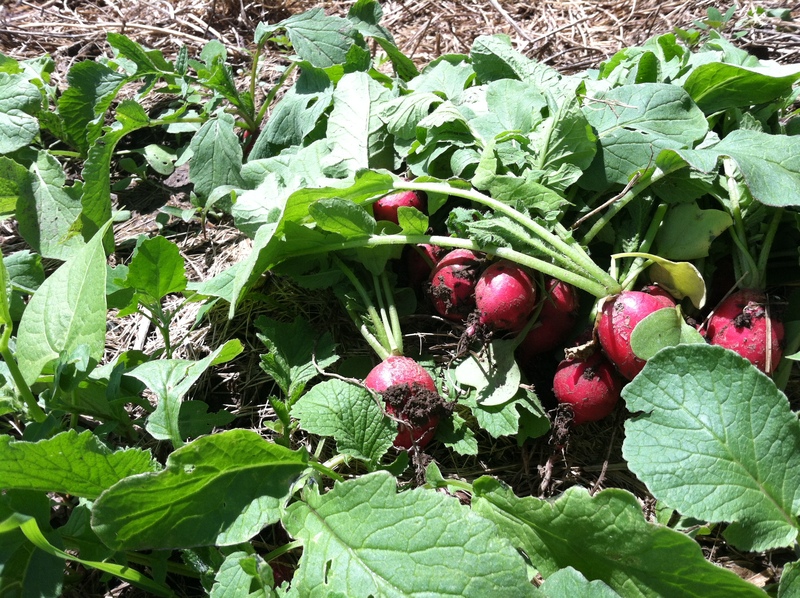 The beets I had were big ones – about four inches in diameter! Directions: Preheat oven 425 degrees. Mix all ingredients and spoon into greased muffin tins. Use the back of a spoon to form an indentation in each mound of beets. Bake for 15-20 minutes. Remove the nests immediately from the muffin tins or they may stick.